We city-dwellers, living in this age though have a lot of new-age boons and technology at our service; are deprived of many simple things in life too. For instance, how many of you have seen a tiger/lion in real? Not many. I wonder how will we show our kids the beauty of nature, apart from in movies and books. I received a package from Redchimpz that contained their Animal & Bird cards. These come in a package like playing cards, but the cards are made of good quality cardboard and there is a round hoop to put them together. The app is available both on android and iOS and has to be installed first, and then the serial key has scanned. The app will then register which theme do you have and show you options to choose from – AR (Augmented Reality), VR (Virtual Reality), 3D Library, Activities and VR Game. In AR, you have to place the animal/bird card of your choice on a surface and point your phone at it – whichever animal/bird/creature you’re pointing at, comes to life and you can make it move around your room. VR, you need VR glasses to view the content. 3D Library has all the animals in natural surroundings and you can make them walk, run, etc. Activities has quizzes and games to test your knowledge in a fun way. The physical cards themselves also have some quick facts about each animal/bird; and you’d be surprised to know how little we adults also know about these creatures. Did you know a Zebra’s kid is called a Colt? Or that peacocks are both plant and meat eaters? I did not know that. 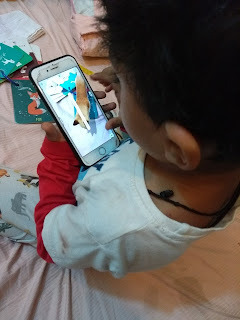 Since my kiddo is still 3, I have to assist him a bit, but he has now got a hang of starting the app on his own and pointing the camera to the cards to see them come alive. He has also learnt most of the animal and birds’ names which is great! And when he see’s that particular bird or animal in reality or on TV, he gets all excited and calls out the name. At Rs.349 a pack, these are great for your kids to learn in a fun way, and they make a great gift too! Themes you can choose from – Animals, Birds, Insects, Aquatic animals. favourite creatures in 3D. Tap the screen to make them move or make a sound. 16 Virtual Reality journeys – Rotate the screen to see how they look from every side. Go for a walk with your favourite animal in the virtual world. 5D+ CARDZ is a perfect mix of fun and education. It provides hours of entertainment and mental stimulation through interactive games. AR and VR help visualize new concepts more easily and the use of Flashcards promotes “active recall”. Since these cards can be separated into groups depending on how well you know the contents or which theme needs more attention, it is the most scientifically optimized way to improve memory performance. Follow them on Facebook or Instagram, they keep having contests and giveaways where you can win a pack for your kiddo.